Matched set, aged cosmetically and sonically with added punch. Each Texas Hot is carefully assembled and hand-wound like the traditional classics. Careful attention to details like scatter-winding ensures that the Texas Hot looks and sounds like a classic Strat should. 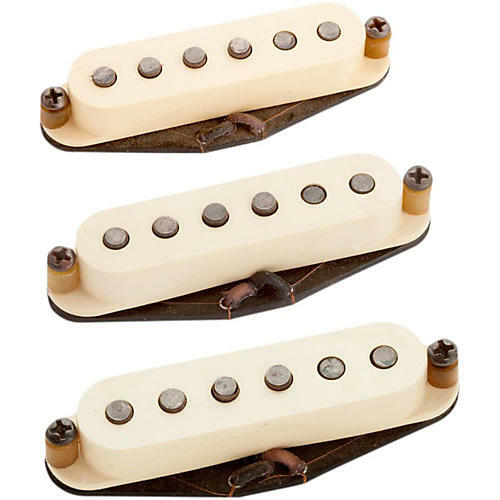 Seymor Duncan makes them for the player wanting the closest re-creation of a vintage pickup. The magnets are calibrated and the coils are wound "top going" with "north" magnetic polarity, the same as the early vintage models. Each cover is individually aged: not just injection molded with custom colored plastics. Each pickup comes complete with screws, schematics and vintage "push back" cloth braid hookup wire. Order this set for your Strat today!